Still nothing on Blue Sky? My guess is that they'll still keep going. From what I understand everything will continue as usual after the merger meaning Blue Sky still making movies at Fox. Although this release is really just a “Christmas bonus,” Deadline does speculate that the experiment could be closely watched by Disney as the company prepares to purchase many Fox assets, including Deadpool. Not sure if it has been mentioned before, but I wonder what will happen to the old Fox logo for movies made after the deal is completed (Disney will probably continue to use the logo for Fox movies already released). Well they'll probably still be there. It's a lot like Touchstone, any movies released by Touchstone still contains their logo (Nightmare Before Christmas post-2006 being the only exception so far). My only hope is that once this sale is complete, Disney does the right thing and restores the logo and fanfare for SW I, II, III, V, and VI. I mean, they'll have to. Heck at this point, reward Fox and give them permanent distribution for those films along with IV. Maybe even let Fox co-distribute IX. Not to mention showing them the un-edited versions, but that's hoping for too much. The Fox deal should also benefit Hulu LLC, which will have a majority shareholder for the first time in its history. "We'll own 60%, which will give us considerable say in how Hulu is run," Iger said, regarding Disney's acquisition of Fox's 30% stake in the online service. Comcast Corp. holds 30% and AT&T Inc. has 10% following its purchase of Time Warner Inc. this summer. While Disney will be the boss at Hulu, Iger said it will be "fiscally responsible to the other shareholders" in the video venture. Hulu has at times lacked strategic direction and has lagged behind Netflix Inc.'s (NFLX - Get Report) viral growth in global markets. With divided ownership, the partners may have been reluctant to put much money behind new shows and films. That should change, Iger said. "We think there is an opportunity to increase investment in Hulu, notably on the programming side," he told investors. Comcast beat Disney in the bidding war for European satellite TV Sky Plc, in which Fox owned a 39% stake. Disney agreed to sell the Sky stake for $15 billion, which will help finance the Fox deal. While satellite TV is a legacy media business, Iger had hoped that Sky's customer relationships would help Disney launch its online streaming services in Europe. "It could possibly be that it takes us a little bit longer to penetrate these markets," Iger acknowledged during Thursday's call. Still, the Disney boss seemed to be at peace with the results of the Sky auction. "You can't cry over spilled milk," he said. It seems the EU is requiring that Disney sell some TV assets like Lifetime and the History Channel. Looks like Disney passed its last major hurdle. China has approved the Fox sale. Last night, The Simpsons predicted another Disney merger. Will this one come true as well? Let's hope not! 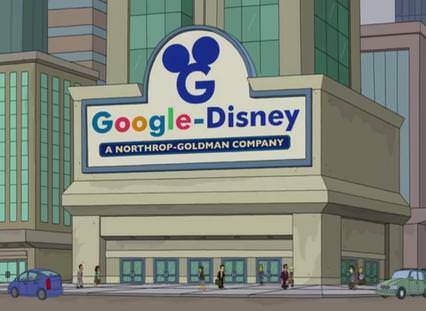 I made a similar joke with some friends about Disney buying google+ and calling it disney+. Its funny that while they didn't buy google, they did announce a service with that exact name. Time Warner currently owns 10% of Hulu. It paid $583 million for that in 2016, back when Hulu’s value was estimated at being less than $6 billion. Comcast also owns 30% of interest in Hulu. Disney has stated that they are not interested in buying out these other partners, and would rather retain them and their properties. Disney is, however, interested in expanding the Hulu brand worldwide. Presently, Hulu is only offered in the United States and Canada and boasts 20 million subscribers. On the other hand, Netflix is offered globally, has 137 million subscribers and an estimated value of $114.3 billion. The timing of this acquisition is a little odd, because Disney has its own specially branded streaming service set to become available next year. Disney+ will be aimed at families, with kid-friendly content. However some of the PG/PG-13 material that will be offered is pretty enticing to older viewers, like two ‘Star Wars’ shows– Jon Favreau‘s ‘The Mandalorian’ and a ‘Rogue One’ prequel starring Diego Luna as Cassian Andor— and new original Marvel series including a ‘Loki’ show starring Tom Hiddleston. As it stands currently, the Marvel-inspired ‘Runaways’ is available on Hulu. Whether or not Disney opts to add any more original material to Hulu remains to be seen. It's not exactly a merger but these news came too soon after that Simpsons episode.